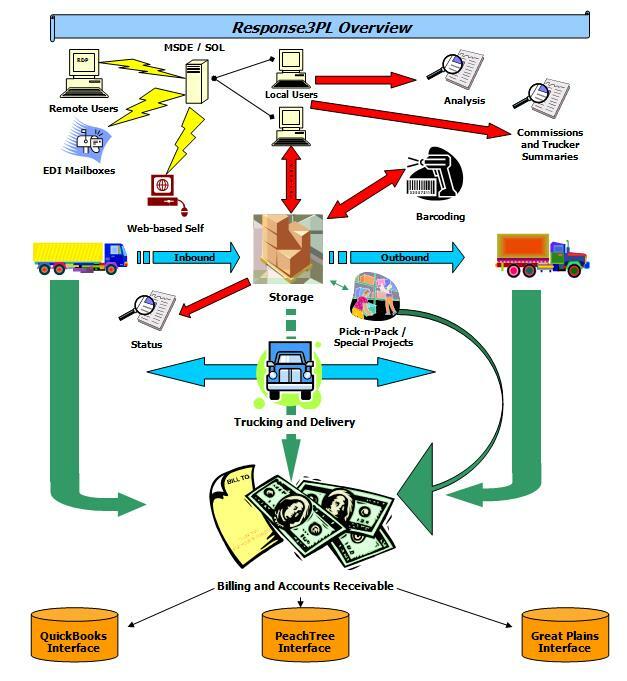 What does Response3PL bring to your Logistics Operation? Checking Stocking levels shouldn’t require a walk to the warehouse. Use our Customer Search to quickly locate accounts by Name, Address, Phone or Zip Code. You can then check stock and answer questions about stocking information quickly and efficiently, process new orders, update information or produce Status Reports on demand. Do you have name and address information in an accounting package, delivery preferences in a Rolodex, stocking breakdown on a spreadsheet, and pricing in someone's Palm Pilot? If so, then there's a good chance that at some point you've missed some of this information and have had to "make it right". Get it right the first time and centralize your Client Information into Response3PL. I need to show my client where it all went! Upon receipt of goods, Response3PL creates records in an Inventory Ledger that allows you to track every IN and OUT for any specific item in your warehouse. When your customer demands to know where the “fifty cases of widgets” went, you can produce a report and show them. This customer gets charged for the Inbound; that guy only gets charged for Storage. Each customer may have his or her own deal. You can assign prices down to the level of an activity and Item with Response3PL. Storage Invoices take three days to do! Response3PL will generate Storage Invoices at the press of a button; giving your company more time to accomplish other business operations. Not everyone should have access to everything. That's OK; Response3PL has its own security module that allows you to enable/disable any of its programs by user or by group.